Sent to the Mills Archive by Richard Everard, August 2018. 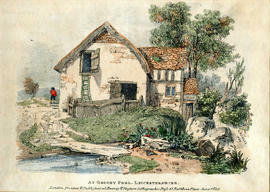 Image of Groby Old Mill, copy of article from "Leicestershire Historian" re Groby Old Mill. images and transcript of "Abstract of the Title of Richard Everard to a Mill Messuages Land and premises at Mountsorrel in the County of Leicester, 1842". These items may be consulted free of charge at the Mills Archive; please email visitors@millsarchive.org to arrange an appointment. Catalogued by Nathanael Hodge, November 2018.